Bill said it…WE ARE GALLOPING ! 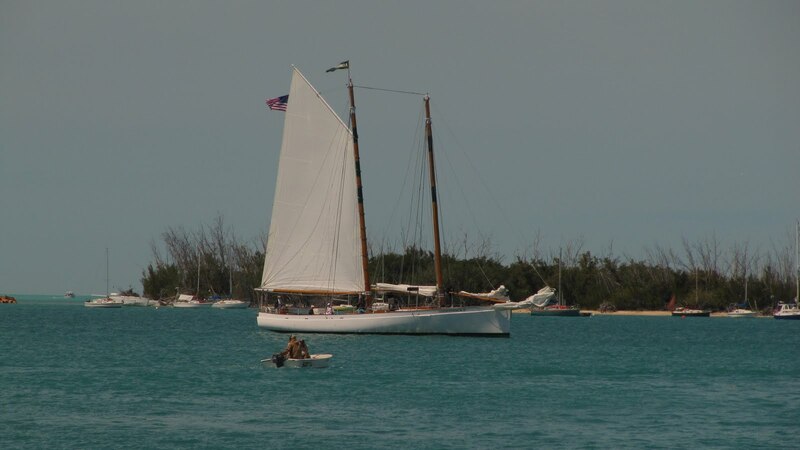 On a close reach for Key West 53 degrees off the wind. If this holds we will be there at 0800 hours tomorrow. I’m betting on 1200 hours. I missed the sunrise again, having pulled 3 hours at the top of the night and another three at the bottom. By 0530 hours I was cross eyed and happy to see Bill. It is a beautiful morning, warm with partly cloudy skies. Big puffy cumulus looking like chunks of cotton 360 degrees around. I’m steering by remote control and keeping a couple of points above Key West. 1400 hours Wind has shifted and we are on the long awaited downwind leg. Seas are down to 2 feet. Bill put up the Spinnaker rip and all. 2100 hours Full main, jib and motors running in neutral to charge the batteries. I cooked the last of the Mahi. Good…. but Bill’s was much better I could tell he thought so too. After Dinner we played some cards. I’m going to crash early we are crossing the Gulf Stream in a few hours and it’s always interesting in the Stream. 3/5/10 Bill took the first watch; I relieved him at 0200 hours and stayed on until 0530 when I started seeing crossed eyed. It was the coldest night so far, I wore long johns and two pair of socks. Not much to report. Steady wind, Blowing Spray and increasing commercial traffic. 0930 hours It looks like it might be our last tack of the passage. After tacking for several hours in the narrows we are heading 281 degrees and it is dead nut to Key West. The channel has made a slight bend to the west and the winds have clocked a tad to the east. If we can keep up this most excellent speed of 6.5 kts. (doubtful) our time to destination is 50 hours and 30 minutes. 0945 hours A freighter is approaching from astern…big sucker…, we tacked to starboard and he crossed our bow 90 degrees off our course. It was a big green equipment ferry; I could not see what flag he was flying or any flag. We crossed his track when he was about one half mile away and his prop wash set off the shallow water alarm. 1100 hours Bill is sleeping. 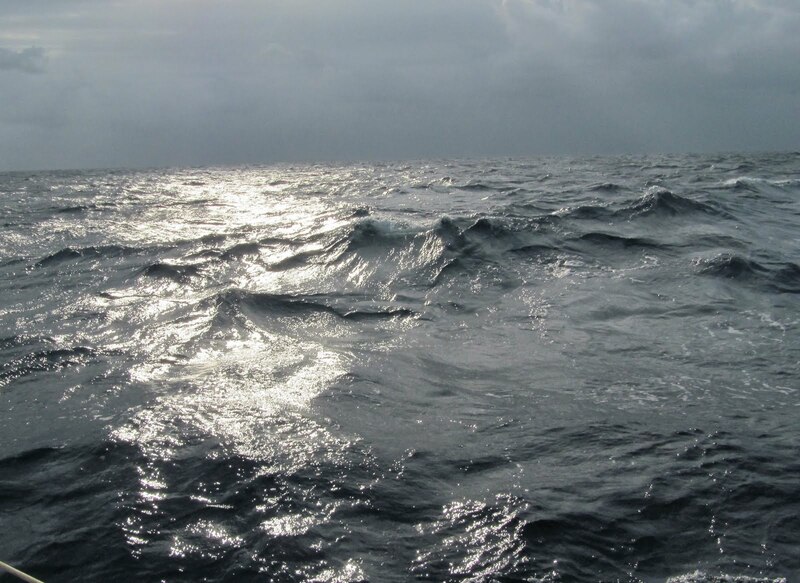 Seas are flat, boat speed is 3 kts wind is 5 to 7, the GPS reports that we are 100 hours out. This is the toughest sailing so far, you cannot feel the wind from inside the pilot house and when the winds are light and on the bow, it’s easy to miss a shift and find yourself in irons. Now is the only time I wish we were in a sloop. 1145 hours I’m sitting at the stern taking a little sun. The wind is down Bill has decided to burn some fuel. I can see Cuba to port. 1600 hours Bill caught a Mahi Mahi ! Hell!…I didn’t even know he had a line out. BUT…I did… hear the reel start to sing as that beautiful teal colored fish took the hook and ran for life. I called out, YOU’VE GOT A FISH! Bill took the rig out of its holder and graciously offered it to me…But it was his fish and I insisted he deserved the catch. I’d like to report that he stood 6 feet of fighting dolphin on its tail. This voyage however, was no fishing charter; Bill made short work out of bringing it alongside and getting it aboard. He was a bit tender when it came down to the kill, which wasn’t helped any due to the lightweight hammer that was at hand. Three taps and we started to fillet. “Hold On”, Bill hollers… 5 seconds later the boat rolled 30 degrees to starboard. 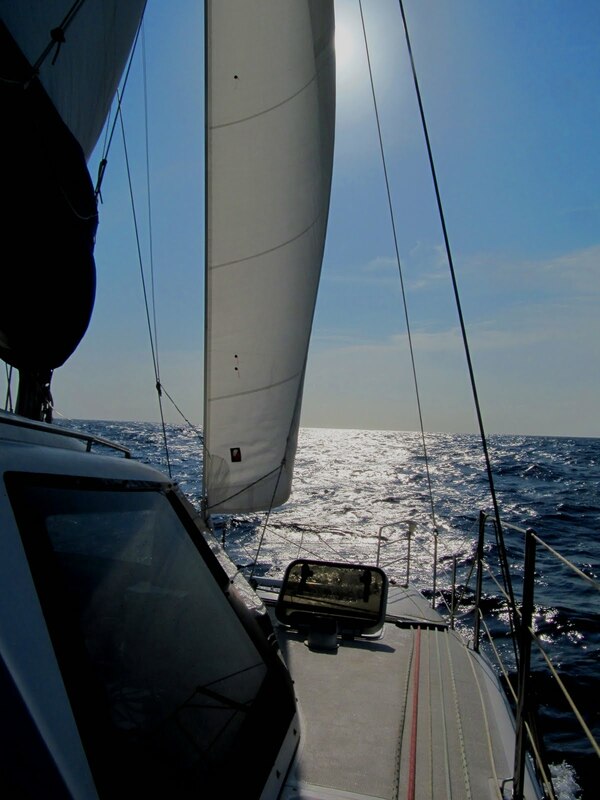 If the No Rush were a monohull instead of a catamaran it would be business as usual, but on this boat … not so much. Still, it wasn’t a big deal , just the biggest roll so far. Cruising cats don’t heel like a keel boat, but they do roll with the sea. So, when Bill hollered, I braced and as soon as the wave had passed I went on with what I was doing. Everything on deck and below stayed pretty much in place and there was no crashing or cursing from the galley. The big wave was more of a surprise, at worst an inconvenience, nothing more. Bill did catch a face full of seawater but we were used to that, it happened two or three times a night when we poked our heads above the pilot house to scan the horizon for other ships. 0600 hours We are reaching hard for the banks around Ragged Island. The front came in full force about 4:30. I had gone below about 0000 hours and Bill let me sleep until I woke at 0430. When I came up on deck the boat was hove to and losing ground at about 1.5 kts. Bill was stretched out on the port settee and I did the same on the starboard side until dawn. 0800 hours As soon as it was light enough to see without flashlights we put in the third reef and hauled in for a close reach to the narrows. We were overtaken by a big commercial freighter also heading for the mouth of the Old Bahama Channel and as he crossed our bow, plowing through the 8 foot seas…Bill and I looked at each other and knew it was going to be a long hard pull. Big wind and high seas, right on our nose. 1100 hours Three hours later and we had gained only 3 nm on the point where Bill had originally hove to. So… we changed tactics and turned the boat downwind toward Ragged Island. We held that course for about an hour and checked the chartplotter and the paper chart. The island was appealing, there is a small settlement that would be fun to explore. Unfortunately all the anchorages would be off the windward shore, not a good place to drop a hook. We didn’t know what the holding ground was and the wind wasn’t going to let up soon. So… we changed tactics and headed back into the wind. We steered toward a tongue of deep water that leads into the shallow banks above Ragged. The idea was that the banks to windward would calm the seas enough to give us safe passage, entering the shallows from the lea side. Had we tried to enter the banks directly from the windward side, the seas piling up on the shallow water would have been treacherous. Right now…I’m in my nest, curled up with pillows. I just finished the movie Bill and Ted’s Excellent Adventure on the laptop. Bill calls me up when it’s time to tack, otherwise I’m content listening to The Beatles White album on the IPod or the “mystery music” coming from the boat. Both of us have been hearing music when no music is being played. It’s weird… Bill says he hears Opera and I hear everything from heavy metal to slow ballads. Just now I could swear that I heard a steel drum playing “Stand By Your Man”. There is huge variety of sounds coming from the boat… swishing water along the hulls, bangs and thumps from the waves, the generator humming… all mixing together making a grey noise that my mind is turning into something familiar. I kind of like the playlist my brain is creating from chaos. 1245 hours Bill must not be happy with the progress that we are making because he just started the motor. 1400 hours Still on motor the seas are pounding us. 2000 hours On the Banks I put out a fishing hook … just because… We lounged around reading and watching the sky. The winds are still high (18kts) but the seas are down thanks to the shallows. We are still bouncing around and it’s far from an ideal anchorage but it beats the hell out of the big rollers of deep water. We are in 35 feet of water which is a bit deep for the scope and the anchor did drag a little but seems to be holding fine now. It’s comfortable for us even if it is a bit blowy forward. Thank God there are no wives aboard or we would be in the endless anchor debate. Full moon and steady winds at our back. The boat is surfing along at 6 kts and there is nothing but open ocean for hundreds of miles ahead. To starboard, I can see Matthewtown glittering on the Northwestern tip of great Iguana Island. The village is about a mile across and can’t be more than 200 people. Ah well …maybe next time. I guess the same goes for Guantanamo it’s only 122nm. off my port bow… another day and maybe another Regime. Yesterday was good, after Bill and I cobbled together a new mainsheet system we cooked dogs for lunch. I slept first, and the dreams just kept on coming, this one was about some “event at the library”, everybody seemed to know each other and were happy. Later we watched a movie and played cards. No Worries on No Rush. 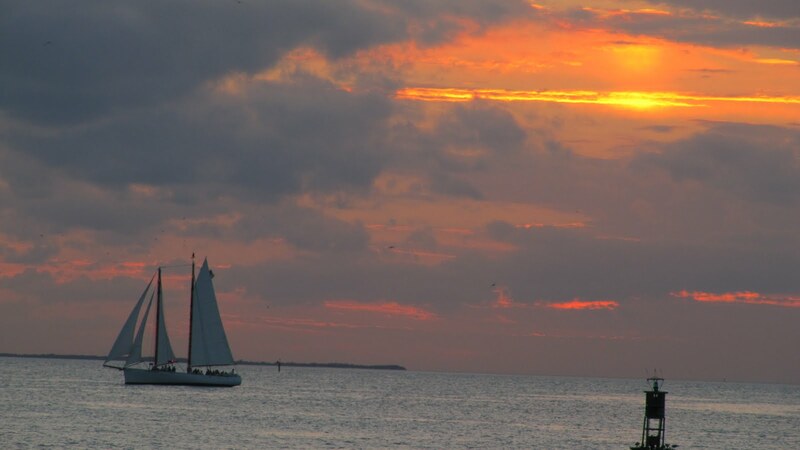 We talked about what to do and where to go when we get to Key West. Skipper says I get to pick the itinerary and hints that he would like to see The Dry Tortuga, he thinks there is some good snorkeling around there. I’ve seen it… but it was after a long slow sail from Marathon and nobody felt like getting into the water that day. So if he wants to keep going west after Key West…I’m good with it. Dinner was a great beef stew made from scratch. While Bill was cooking I hung out on the bow and took pictures. The clouds parted just before sunset. After Dinner Bill had some serious pain in his lower back. He had mentioned having Kidney stones a few years ago and the location was right. So… Bill took a Vicadin and went below. Fifteen minutes later I screwed up a wind shift and before I could get the boat straightened out he was back on deck saying the cramps had gone and he was feeling fine. I told him the problem must be menstrual and we both laughed. It was troubling… but there wasn’t anything I could do about it and I figured that if things went to hell I could set course for Guantanamo and call for help on 16. I’m sure we would have assistance in short order. There was a good display of bioluminescence in the wake. The movie was Three Feathers about British troops fighting in Sudan during the late 1800s. When the wind picked up right after dark we put a reef in the main and the boat settled right down. I stayed on deck until we saw the beacon on Grand Iguana. 0240 hours 6 nm southwest of Matthewtown. The winds are starting to increase and the cloud cover is lower and thick. I ducked below and cleaned up the dishes from last nights feast. When I came up I let out the main and tightened the preventer. It was all good … time to catch up on my murder mystery. 0500 hours Bill is up and I’m ready for sleep. 1145 hours We have been Wing on Wing since midday yesterday only having to switch sails once. The seas are down I so I used the opportunity to open the foreward hatches on my side of the boat. It was getting a bit ripe in there. 1800hours Bill made chicken with Bell pepper wraps for lunch. There has been no change in wind direction but it is starting to build. We are expecting it to begin clocking from east to south and then from the southwest which is going to make for a bumpy night. Spent the afternoon reading. Just for the heck of it I put out the fishing gear …no joy. Bill and I were playing cards, the seas were 2-3 feet and coming from astern, as they had been all day. We were talking about putting a reef in the main and watching the clouds thicken ahead… Suddenly Bill put down his cards and said, “Lets do it RIGHT NOW”. So… we reefed the main and furled the jib. As we finished the wind died and we could see a rain squall approaching from the Northwest. When it hit it shifted to the north. The best way to make good time in these condition was to motor and.. so we did. Dinner was great, Pasta Bolognese, which we ate quickly. The weather was looking like it was going to get worse. We were still several hours from the narrows but the skys ahead were very dark. There was a midsized yacht tracking us on the starboard we kept an eye on it until it sped up and crossed our bow. The night was pitch black and it was impossible to make out the horizon. It’s like being inside a bowl of India ink. We turned off the running lights for a second and you couldn’t even see the bow. I have never experienced such “blackness. Later the bioluminescence started up with a variation on last night.. Tonight it was a green cloud with brighter globs of light within. Amazing! Again we turned off the running lights and all the instruments. WOW…The only thing visible were little green flashes coming from our wake and bow wave. WOW… I stood on the transom steps and imagined it was the view of our universe from a million light years away. Bill suspects the front is Northwest and will be on us about midnight, right now we are in the convergence and it’s strangely calm. 2100 hours Just before Bill went below he suggested that I disconnect the Garmin C-176 from the boat’s power just in case the storm knocks out the chart plotter. The lightning started from the NW but now it’s across the entire starboard side with an occasional flash to port probably from smaller storm cells. It would have been great to check it on the radar but it decided to be our latest mechanical issue and went down yesterday. 2300 hours I’m a little spooked…probably for no good reason but this is new to me. As the front approached the air became super saturated. Everything was wet. we are still motorsailing but the jib is out and we trimmed the main to starboard. Bill is up. Time to get some sleep it’s going to be a long night. 0200 hours What a night! I was sitting on one of the director chairs trying to read but the seas were so active that my chair I was sliding all over the deck. At some point I slid over by the starboard wheel and wedged my foot into the helmsman seat to hold position and noticed that there was a strange clicking noise coming from the wheel. The auto helm was working hard to keep the boat on course, it was constantly in motion, turning the wheel 90 degrees and more and while I was watching, it failed. I could hear the electric motor trying but the wheel wasn’t moving. I disengaged the clutch and took over to prevent a crash jib. When Bill came up he knew right away that the problem was the belt drive had failed and the only fix was to tear down the mechanism and replace the belt. He was sure there was a replacement onboard but it took an hour of digging through every locker and lazerette on the port hull to find it. I was hanging upside down with a flashlight in my mouth looking for something I’d never actually seen. Eventually I found it on my second sweep of the lockers. Bill took off the wheel and thirty minutes later we were back in business. Bill stayed on deck and I went below. This time I dreamed one that would have made Federico Fellini proud, featuring George W and the entire cast of the Nutcracker Suite with lots of kids all running around the Governor’s mansion. Got to love those trip dreams! 1000 hours It’s all good …Bill and I are listening to the Beatles White Album and I was marveling at our skill repairing in the auto helm after dark in a rocking boat. Bill pulled two watches letting me sleep so I was feeling rested and ready. He suggested we watch the new Star Trek Move and we were just getting into it when the 4th equipment failure happened. Captain Kirk had just ordered up a full salvo of Photon Torpedoes when, CRACK… the main traveler car exploded. The large triple sheave block went flying to port and we were lucky not to be sitting at the helm or one was could have been injured. Bill jumped up and grabbed the block and secured the main keeping it from getting caught up in the stays. We first tried to attach the block to the car using 5000 lb. test spectra but it didn’t take long to see that the steel straps we tied into were perfect for handling a vertical load but not the horizontal load from the main sail. After rummaging through all the hardware we could find and scratching and thinking, Bill came up with a working fix. There were two heavy duty eyepads used to lift the hull during transport located 12 inches on either side of the traveler track. Using the spinnaker sheet, the old main sheet, and several large single blocks we fashioned a way to trim the main that also served as a vang and preventer when going downwind. It added a couple of steps while tacking but it worked perfectly. Another triumph for the dynamic duo! While we were working on the rigging a U.S. Coast Guard plane did a fly-bye from the south east, 40 minutes later he returned on the way back to Puerto Rico and hailed us on channel 16. He wanted to know… who we were? … where we had come from and where we were going? Did we have any firearms on board and what was the reason for our trip? Now we were in the system … Homeland Security had plugged us into their computer and they had a pretty good idea when we should arrive in Key West. 1900 hours Both of us took long naps during the afternoon. I’m feeling a little beat up with sore muscles but thats a good thing. No Pain No Gain … Right?